One of the most effective ways to burn calories and get fit is by cycling. The activity increases your heart rate while improving your circulatory system. With that being said, do you burn more calories cycling indoors on a stationary bike or outside on a trail? Cycling enthusiasts often fall into one of these two categories. 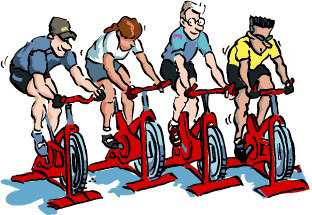 Dedicated spinning classes make it possible to pedal at high speeds in a confined location. You can spin with a group of other enthusiasts with a motivating teacher at the helm and music pumping. However, mountain or road biking provides you with the thrill of nature. There’s always unexpected obstacles to encounter and a sense of adventure. Whether it’s a matter of preference or simple time constraints, it’s not uncommon for cyclists to choose an exercise method and stick with it. While they may look similar, the two activities do offer their own unique advantages and disadvantages. If you’re on a goal to burn the most calories, the best option is all down to how you ride. To better understand how to burn calories effectively, it’s good to know how the process works. Humans are constantly burning calories, even in a resting state. Calories are burned when muscles are being used. They will use oxygen to convert fats, sugars, and proteins into ATP, which is used as an energy fuel for cells. The way in which your body creates ATP depends on the type of activity you’re doing. Aerobic metabolism is used to create ATP when the body is performing a less intense but lengthy workout. 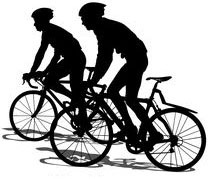 Cycling is often considered an aerobic exercise because it increases the heart rate and remains constant. When the heart rate is increased, the body will burn more calories. Additionally, it uses up glucose and improves overall heart health. Anaerobic metabolism is used to create ATP during short and intense activities. These exercises target specific muscle groups rather than the entire body. Typically, strength training exercises are considered anaerobic. However, there are instances in which cycling can be considered anaerobic as well. Now that you understand the difference between anaerobic and aerobic exercises, how exactly does that relate to cycling? The way your body reacts to the exercise, regardless of if you’re stationary or outdoors, depends entirely on the intensity of your workout. While it’s often viewed as an aerobic exercise, intense cycling will cause your body to get ATP with anaerobic metabolism as well. With a stationary bike, you will reach between 75 to 95 percent of your maximum heart rate. With a consistent speed, the body will maintain this heart rate. As a result, the body is at it’s most efficient state to burn the most calories in a short period of time. This is when stationary biking is aerobic. Should you increase the intensity or resistant, it will turn anaerobic. One of the biggest benefits of a stationary bike is that it operates with a heavy fly wheel that can weigh up to 40 pounds. This provides enough resistance to keep you moving. The wheel will continue to move as it spins, requiring you to keep up the pace. It also works out hamstrings as the wheel slows down. On average, a 180-pound man will burn roughly 572 calories an hour at a moderate speed. Outdoor cycling is much more complex and intense on the body because it is filled with so much unknowns. The activity will easily raise your heart rate to a level that matches that of stationary cycling. In fact, it will probably surpass that. However, it can be difficult to maintain that heart rate because of turns, obstacles, navigation, and so much more. Not only that, but outdoor cyclists are often met with bursts of intensity that aren’t found on stationary bikes. Whether it’s a turn, hill, or rough terrain, outdoor cycling often requires you to constantly adjust your speed. This results in a more anaerobic workout. The main muscles that experience a workout are the hip flexors and quadriceps. While it will provide you with a more targeted workout, it requires constant cycling to keep the heart rate elevated and burn calories. A 180-pound man can burn between 650 and 700 calories an hour at a moderate speed, depending on the intensity of the trail. The most obvious advantage to indoor cycling is the convenience factor. You can easily hop onto a bike at the gym and pedal for 30 minutes without even stepping foot outdoors. You can listen to music, watch a television show, or even chat with friends. Huge spin classes also have the added benefit of motivation and guidance from an experienced trainer. Stationary biking is also safer and easier to maintain. The activity can be performed regardless of weather conditions and there’s no immediate worry of accidental injury. The activity is also good for raising and maintaining the heart rate for better cardiovascular health. It’s easy to set a heart rate target and monitor progress. When it comes to disadvantages, the biggest of stationary cycling is the inevitable plateau. While it’s always good to perform cardio on a regular basis, it’s not uncommon for enthusiasts to hit a plateau in terms of progress. With stationary bikes, there’s no variation. You work out the same set of muscles each time. There’s no wind resistance, tough terrain, inclines, or anything to keep things interesting. Ultimately, the body will get used to the activity and it will become more difficult to increase the heart rate. Plus, indoor cyclists are prone to getting bored after some time. Outdoor cycling is generally a more fun activity. You’re out in the fresh air and have to keep a constant eye on the trail in front of you. There’s never a dull moment. It’s also much more intense than stationary biking. Depending on the particular trail you’re on, you may experience sharp turns that require you to burn more calories, steep inclines that require a burst of intense energy, or smooth areas where you can coast. This variation will keep your body constantly guessing. There’s also a lot of ways to improve. If you feel like you’ve dominated a trail, there’s always another one that’s more difficult. Many cyclists also perform time trials or challenges on familiar trails to shake things up a bit. The main downside to outdoor cycling is that you can’t always keep a consistent heart rate. Due to the nature of the sport, there’s always a way to take shortcuts. For example, a downhill portion of the trail may cause you to relax for a bit. This will decrease your heart rate and burn fewer calories. It’s nearly impossible to keep a consistent speed when you’re biking outdoors. Another disadvantage is that it’s not always possible to cycle. It requires a lot of gear and can be very time-consuming. Furthermore, outdoor cycling can be dangerous to those that aren’t prepared or experienced. To sum up, it’s all about intensity and consistency. The key to burning the most calories is to raise the heart rate at the prime level to make a difference while throwing in bursts of intensity to push the body. While stationary cycling can get your blood pumping, outdoor cycling provides you with the intensity and variation to work out your entire body. From a pure numbers standpoint, outdoor cycling is the way to go. However, either option will help burn calories and lead to overall better health. Regardless of whether you want to brave outdoor trails or stay put with some pumping music, push your body and increase the intensity to see some real positive changes in your body and health.